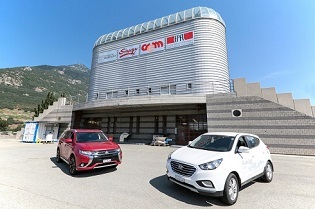 During the first EPFL lab tour of 2019, we invite you to discover the Grid2Mobility Demonstrator in Martigny, one of the projects of the Laboratory of Physical and Analytical Electrochemistry LEPA from the EPFL Valais Wallis campus. The motivation and objectives of the project are a need for clean mobility. Prof. Hubert Girault and his team will present their research for the full-size demonstrator which allows to produce, store and distribute hydrogen necessary for the fuel cell operation. As the number of participants is limited, we will confirm on a “first come, first served” basis. Priority will also be given to the contributors. We will send you a confirmation email. As a Club & Gold contributor, you can be accompanied by one person. Please contact emmanuelle.yanguas@epfl.ch.